" .... Security is our middle name! ...."
NOW ON YOU-TUBE! 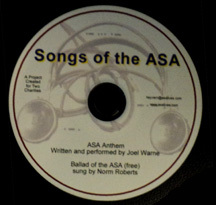 ... WATCH THE "ASA ANTHEM"
Enter the archives - however, please remember this website is "as is" --- yes, there are broken links, missing graphics, and some people referenced are now deceased. Enjoy, use for reference, just DON'T notify me of errors. I realize that, and will try to fix problems on a time available basis. Right now the database is still my top priority, and I'm way behind on that! . ASAONLINE is for your reference, archival, and remembrances only. You must have the "need to know" to access. This is a "me, myself and I" proposition. in the Form Itself I CANNOT contact you! Also if you include ANY COMMAS your email address drops off the spreadsheet!!! If you see anything needing correcting let me know. Other affairs in my life have taken preference, but working on the correctable data daily. Retired and widowed, some of my priorties in life have changed. Major update 3/10/2015 47,406 RECORDS! New Update coming soon. my folks while in Vietnam. please contact me at: heyvern@asalives.com Thanks! Upon receipt & verification, the password scheme will be e-mailed to you. PLEASE use a valid e-mail address, many bounce & I have NO way to contact you! 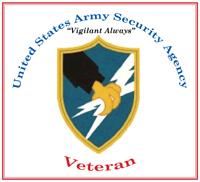 GOT YOUR OWN ASA CHALLENGE COIN YET?? CAUTION! ... Attending an ASA Reunion without one could be hazardous to your wallet! Check the link above if you think you have a concern with this. Thanks! Made from a reclaimed Calif. wine barrel and oak flavor sticks used to add additional oak flavor to the wines. Order turn-around is typically 2-3 weeks. 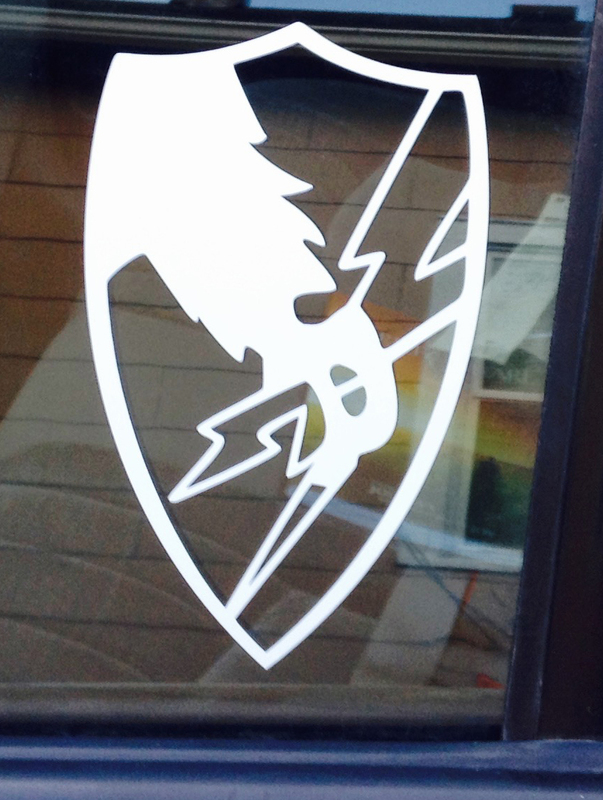 Price: $265, Optional laser engraved duty assignment plaque or name/rank on the back for $25 additional. Will gladly discuss custom ideas. S&H and taxes are not included. Full instructions on how to set up the display provided. A group of us have put together a file that covers our service from 1967 through 1974. LAPEL PIN - HAT PIN or TIE TAC! 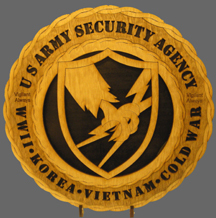 1 1/4" Tall - Formerly worn UNDER the lapel by ASA personnel in Korea, now available for YOU to wear proudly & in the open! Blue the water we don't go near. Yellow is the reason why. Red is for the blood we've shed. As you see, there is no red! One hundred men reupped today. Not a one for the A-S-A! 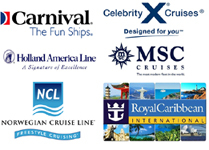 Contact Jerry directly for ordering details, pricing, quantities, etc. 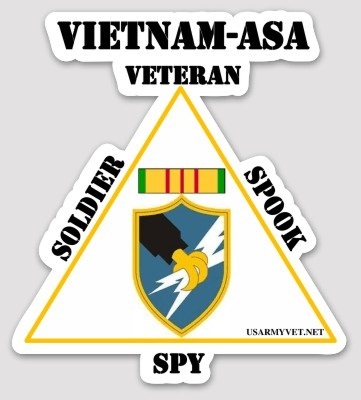 TASA Vietnam Bumper Sticker Available on my Cafepress.com Drop Ship Store. E-MAIL orders and info to: rhmakoto@hotmail.com. and 10 x 12 LEDS with a clear bases. All other sizes orders are considered to be a special order. Accessories and other options are available please e-mail me your questions. 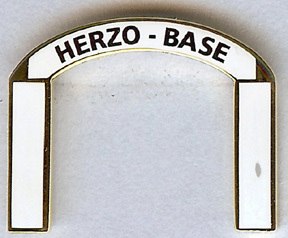 A clear base 8 in x 10 in. price is $65.00 and for the deluxe black base it's $80.00. Larger 10x12 unit would be an additional $15.00. Shipping, Handling and taxes are not included. Handling is only charged on special or urgent orders. Interested in various ASA Unit Emblazoned Wear or Ware? 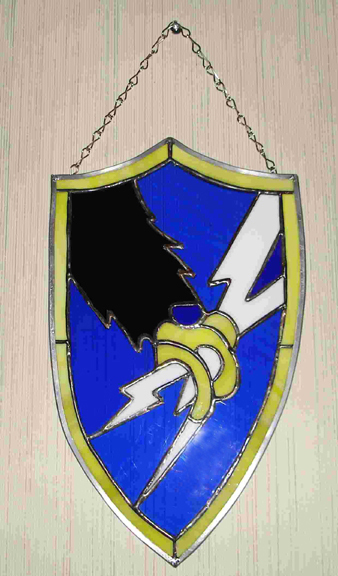 Teal blue within a 1/8 inch yellow border, a shield 2 inches wide and 3 inches in depth,and issuant from the viewer's upper left the leg of an eagle in black with yellow talons grasping two crossed white lightning flashes issuant from upper right points to base. The flashes across the blue field suggest world-wide electrical communications. 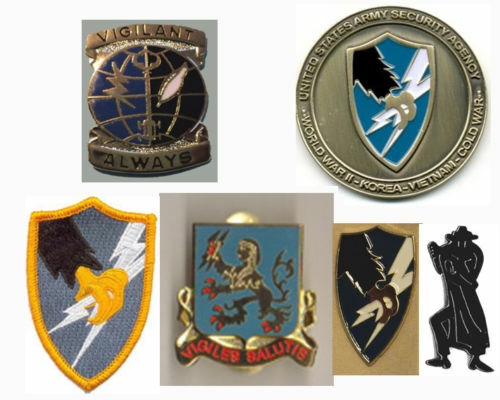 The eagle's claw grasping the flashes alludes to the Agency's general mission, that of insuring the smooth functioning of the Army's communication facilities. Were the men that get the job all done. We fly our standards high. The proud men of our unit also hold their heads up high. Coined for use with the ASA Salute at the time Lt. Col. Louis Millett was School commander in the '60's He also helped with the design of TTC. 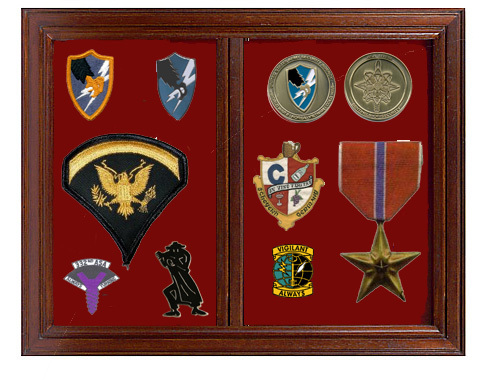 Got Your Shadow Box Made Up Yet? from me, the rest ... you are on your own! 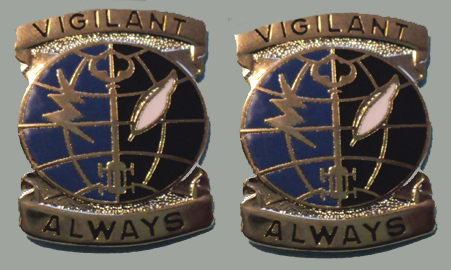 Pin is gold with white inset and black lettering. Richard has created an ASA Sticker. If you are interested, contact him directly. Made to order - order yours now!